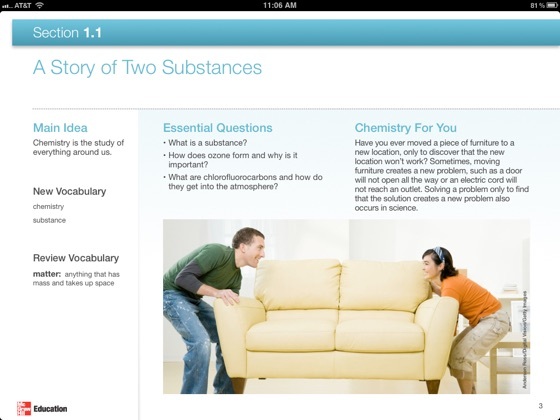 As a former research chemist and current high school chemistry teacher, I see this as the future of textbooks. The interactiveness of this sample was fun and engaging. I didn't particularly like the topic of the introductory chapter, but it does have massive potential for students. Giving teachers the ability to copy and paste items from the text into a KeyNote presentation would be a wonderful addition. 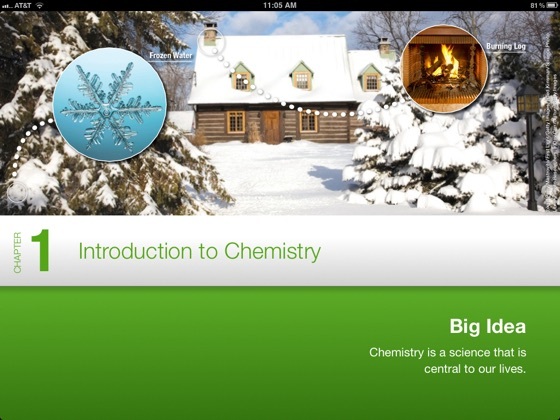 Overall, the introduction, however, didn't really make me feel excited about chemistry or why it might be important to me as a young person taking the course. Some of the pictures seemed outdated for today's students using smart phones, LCD's, and Twitter, all of which seem a perfect segway into molecular motion, matter, and life as we currently experience it. 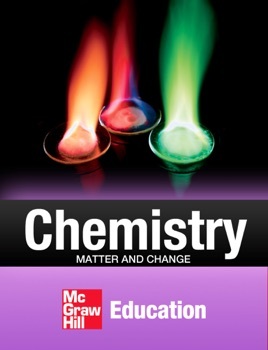 I'm looking forward to other texts that can also engage students to want to read and interact with chemistry in and out of the lab. I am currently a Junior in high school and I am a huge Apple fanboy so I am naturally ecstatic about an announcement such as interactive textbooks on the iPad. I am jealous that I won't have this in my high school career. 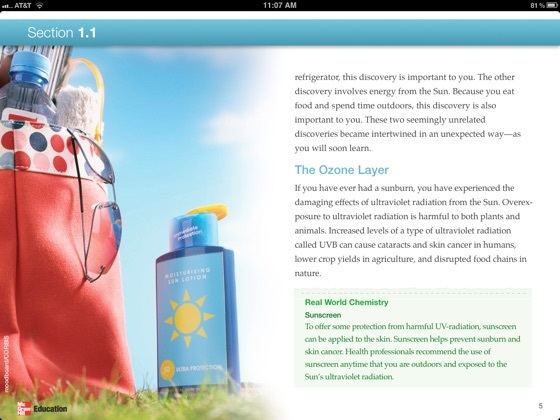 But, and this is a BIG but, even as an actual student in high school chemistry (granted, it is honors chem) even I can see that this textbook is SERIOUSLY lacking in actual content. This book looks like it is for someone who has failed freshman year three times. It is full of pictures and empty space that looks nice but offers little actual educational value. If THIS is the textbook of the next generation in America, I will be the last generation that was sufficiently educated by our school systems. I am a HS Chemistry teacher. I have had a class set of iPads since August and have used them fairly extensively as a student resource and for students to take notes and submit information to me. 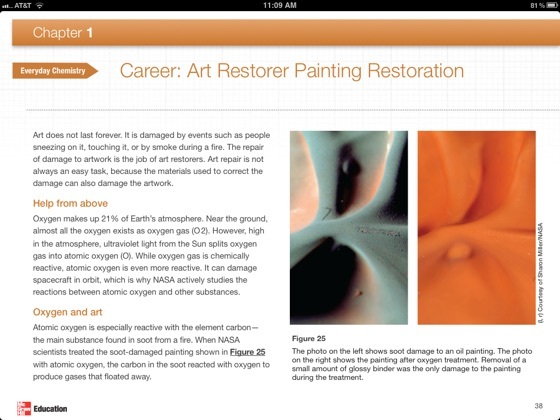 While I understand the need to get something out quickly once it was announced there would be iPad textbooks required the use use of existing material there are many more ways they could have leveraged the power of the iPad with this text. The first comes on page 2 under procedure #1 where it says "Read and complete the lab safety form." - there should have been a link to an electronic version of the form that they could complete and submit to the teacher right there. The whole point is to reduce paper right? I've done this with QR codes and a certain online form provider and the students prefer it immensely to filling out the standard photocopied sheets. There should have also been an imbedded lab e notebook where they can record their data and answer the evaluation questions. Each of the reading check questions should have a box where students can type their answers on their iPad. 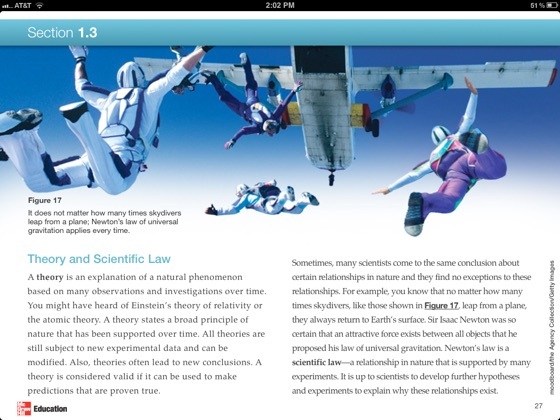 In other words the textbook should also become their notebook where they can add and access notes without changing apps. Looking forward to iText 2.0 where all the features that make the iPad special are available.